I’ve read articles, listened to podcast, and read lots of daily poetry this month. I don’t want it to end! Check on the progress of the Progressive Poem. Listen to Laura Shovan on All the Wonders. Find a selection of daily poem writers on Jama’s Alphabet Soup. 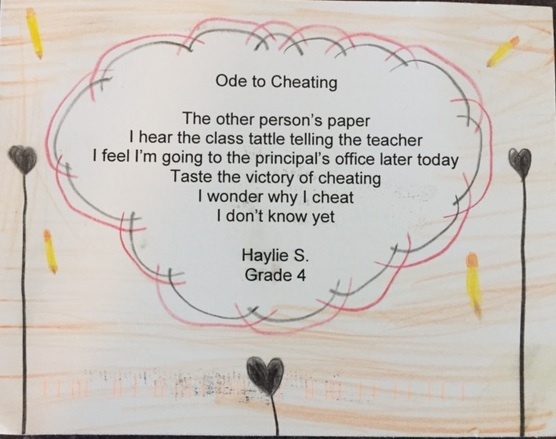 Yesterday I got a postcard poem from Jone MacCulloch’s kids poetry group, an ode to cheating. We will be trying out odes next week, so I’ll share this one with my students. I love the irony of flying hearts and pencils around this topic of cheating. Here’s my poem for today, a little haiku about our state flower Magnolia. They are blooming! An ode to cheating?!?! Oh my goodness, I love that! And “alter offering”…what a beautiful line. Those magnolias are gorgeous! I know your students will love that ode to cheating. Can’t wait to see what they do with this form. Have fun with the odes! The one from Jone’s student should open things up a lot! I can’t imagine having magnolias blooming. They smell so, so wonderful, as you shared so beautifully. I’m with you! Poetry month is so much fun! Have you checked out the Poetry Mosaic at Bookology? There’s never enough time to see what everyone is up to, but I love the ode (forgot to request one of the student poems from Jone this year) and your beautiful poem about the magnolia. Such a lovely fragrance!